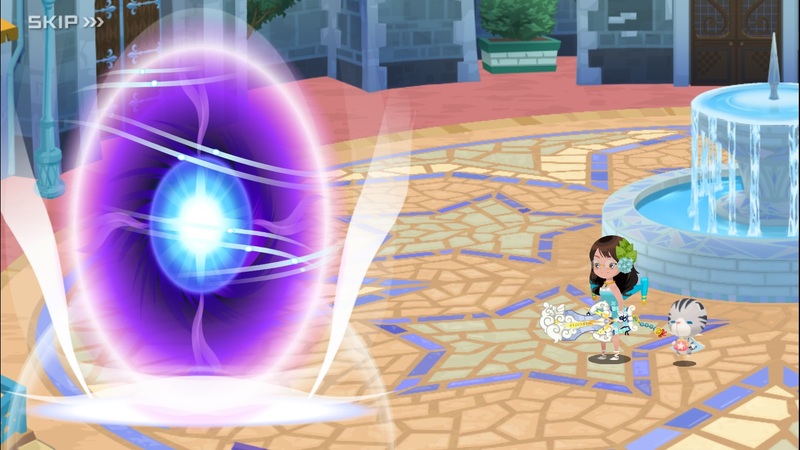 Ah, one of the first original themes written specifically for Kingdom Hearts Unchained X. Daybreak Town is the first land that you visit in the game, and I would consider it the “home town”, as it keeps coming back as the area where most of the important story-line events occur. While I immensely enjoy “Dearly Beloved“, “Precious Stars in the Sky“, and other short musical loops that are included in this game, “Daybreak Town” is particularly special simply because of how long the loop is. Clocking in at around 1:30, there is so much time and space for development, instrumental melody-passing, and even modulation. 00:00 – 00:50 The piece begins very simply with a piano melody going up, accompanied by lower notes. It is hard to tell exactly where the beat is. But then, we add in some pizzicato strings to establish the beat (in a “boom-chuck” sort of style; think 1-2-3, 1-2-3 / boom-chuck-chuck, boom-chuck-chuck), and a main melody comes in with a beautiful oboe solo. An accordion is heard very gently, playing a few harmonious swells to support the oboe. The strings take over the melody, with some other strings begin a tremolo, and a bassoon takes over the bass. 00:51 – 01:20 The next section passes the melody onto the accordion, and the beat seamlessly starts to pick up a bit, with the piano continuing the simple “boom-chuck” beat-establishing rhythm. This section leaves out the strings for the most part (until 01:09), giving the accordion and oboe a chance to really sing. When the strings do come back though, it’s in a call-and-response pattern, echoing what the oboe just played. 01:21 – 01:30 The last section modulates up a fifth (changes key from A major to E major), and has beautiful contrapuntal movement (different melody lines intertwining together) between the oboe and violin. I absolutely love the cello part here as it plays very slow, descending notes that wonderfully complement the other instruments. The way this track loops is very clever: it begins with the piano melody going up, and it adds in that same piano melody, but now it is played simultaneously over the oboe and pizzicato strings (01:39 – 1:57). One of the things that I love about this track—as well as many others in the Kingdom Hearts series in general—is that the instrumentation is very limited: there is only a piano, maybe two or three stringed instruments, oboe, accordion, and bassoon. Soundtracks these days are often very instrument-heavy, and the whole orchestra is playing all the time. This can be awesome, and super epic and emotional, but it is also nice to just have a small ensemble. Again, this is not at all to jab at orchestral pieces that include full strings, brass, woodwinds, 15-piece percussion section, and an entire SATB choir (soprano, alto, tenor, bass). That instrumentation has its place, and is absolutely wonderful to hear, especially live. The giant, grand impression is particularly effective for epic, large-scale battles, or scenes involving a lot of people and a lot of action. But when there are fewer instruments playing at once, each voice certainly gets a lot more of a chance to shine and be heard.